This girl. When Gabby and I got together for her Cumberland Valley Senior Pictures, it was nothing if not fun. You can always expect a good laugh when Gabby is around. I have to say that she is one of my new favorite people. One of the reasons I love photographing high school seniors is meeting the Gabby’s of the world that I wouldn’t have gotten to meet otherwise. Don’t get me wrong, I have enjoyed all of my senior clients thus far and ABSOLUTELY LOVE seeing different personalities and faces come out and capturing those memories for the senior and parents! We started out at Highland Gardens where Gab promptly got bitten square in the middle of her chest. So while she was all itchy and did I mention it was a bit humid out? 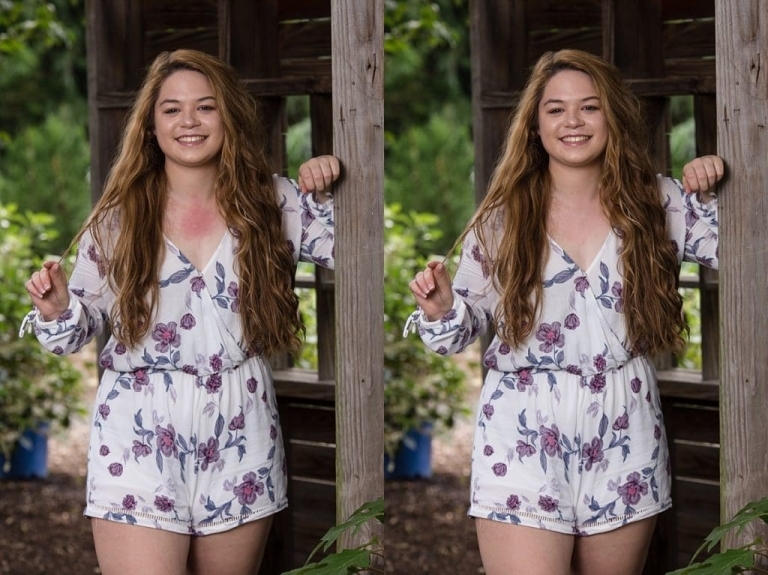 Well, she pulled through like a champ and I managed to edit that red bug bite right out of her images! gotta love the power of post production! While at Highland Gardens, a friendly grey cat wanted to be in Gabby’s senior pictures with her. Gabby took this opportunity to give this little fur ball some lovin’ all while still looking beautiful for my camera! I had to include one of her in the bamboo with a good laugh! I’m sure we were talking about “putting her in a jungle” or something silly! Right next to Highland Garden’s is an underpass area. This was the perfect location for us to change it into a little more Urban of a setting for this part of her senior pictures! It’s great that you can not have to go far in Central PA to get a variety of looks. I think Gabbriella’s mom may have thought I was crazy when I suggested the underpass area, but I believe she was happy with my vision in the end! We braved more bugs to capture some sunflower images for Gab, but we didn’t stay long. The mosquito’s were horrible. No more bug bites necessary for us to leave! I have yet to see her play, but this chick plays rugby. I’m still hoping to get to a match or game or whatever they are called because I think girls rugby is pretty bad a*%! I mean, you have to be pretty tough to play rugby, right? So there you have Gabby, Cumberland Valley High School Senior, class of 2019! Have you had your senior pictures taken yet? Now is an amazing time with the beautiful fall weather. If you are ready to schedule or have a question, feel free to contact me. Take a minute to check out Kayden’s senior session from this summer and give her some love while you’re here!